Stephen Sondheim has won seven Tonys, an Academy Award, seven Grammys, a Pulitzer Prize and the Kennedy Center Honors. His career has spanned more than half a century, his lyrics have become synonymous with musical theater and popular culture, and in Finishing the Hat—titled after perhaps his most autobiographical song, from Sunday in the Park with George—Sondheim has not only collected his lyrics for the first time, he is giving readers a rare personal look into his life as well as his remarkable productions. Along with the lyrics for all of his musicals from 1954 to 1981—including West Side Story, Company, Follies, A Little Night Music and Sweeney Todd—Sondheim treats us to never-before-published songs from each show, songs that were cut or discarded before seeing the light of day. He discusses his relationship with his mentor, Oscar Hammerstein II, and his collaborations with extraordinary talents such as Leonard Bernstein, Arthur Laurents, Ethel Merman, Richard Rodgers, Angela Lansbury, Harold Prince and a panoply of others. The anecdotes—filled with history, pointed observations and intimate details—transport us back to a time when theater was a major pillar of American culture. 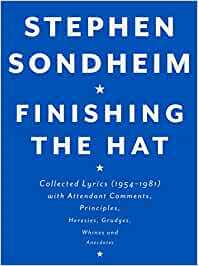 Best of all, Sondheim appraises his work and dissects his lyrics, as well as those of others, offering unparalleled insights into songwriting that will be studied by fans and aspiring songwriters for years to come. Accompanying Sondheim’s sparkling writing are behind-the-scenes photographs from each production, along with handwritten music and lyrics from the songwriter’s personal collection. Penetrating and surprising, poignant, funny and sometimes provocative, Finishing the Hat is not only an informative look at the art and craft of lyric writing, it is a history of the theater that belongs on the same literary shelf as Moss Hart’s Act One and Arthur Miller’s Timebends. It is also a book that will leave you humming the final bars of Merrily We Roll Along, while eagerly anticipating the next volume, which begins with the opening lines of Sunday in the Park with George. Stephen Sondheim has written award-winning music and lyrics for theater, film and television. He is also the coauthor of the film The Last of Sheila and the play Getting Away with Murder. Sondheim is on the council of the Dramatists Guild of America, having served as its president from 1973 to 1981. He lives in New York City. 5.0 out of 5 starsYou better love genius and Broadway shows. You better love genius and Broadway shows. Nothing before has been like it. Buy both versions. 5.0 out of 5 starsFor all Sondheim Fans Everywhere! This is a superb book with pictures of the original casts, posters and Mr. Sondheim. He is candid in his writing, and his lyrics are made more wonderful by the music that either he or others wrote. If you love Sondheim, then this book is definitely for you! Who better to do so? with a lot of extra notes on other composers lyricists writers with explanations of why he thinks so. A real gem in the field of critical analysis of theatre. PLUS some fun gossip! So good. Fascinating reading about the ideas that became the musicals we still adore today. 5.0 out of 5 stars5 stars ! Great deal fast shiping ! I recommand this seller. Thank you. Very inspiring self-critique by one of the leading creatives of the Twentieth Century. 5.0 out of 5 starsAbout as close to genius as one can get. "Finishing the Hat" is a perfect read, except for the title which is from a show not covered in this volume. But it does sum up a great deal of what a brilliant mind like Sondheim's goes through to produce the musical miracles that he does. I loved every moment.The lyrics alone are worth any price, but the insights are so stupendously insightful that they leave one almost breathless as one reads and rereads just to catch a precious glimmer of the struggles and successes that are Sondheim at his best...which he almost always is. That is my one complaint about the book; he is too critical of himself. There are songs that he seems to find little in to praise, but I could listen to them forever. Cynical - "I'm Still Here", "The Ladies Who Lunch" or sentimental - "Send in the Clowns", "So Many People" - this is like discovering Aladdin's treasure; sometimes rediscovering them with so much to cherish. Some of his songs slip into the shadows, but are here lovingly gathered up and brought back into one's mind and heart - "The Road You Didn't Take", "Another Hundred People". I think I'd happily give up a year of my life to spend one hour talking to this unique master of the music of the theatre, and explorer into the very souls of us all.